To give you the motivation to change some of your habits, please take a moment and have a look at this chart I came across last week, while browsing Stumbleupon. Have you done it? What shocked you the most? For me, it was the fact that when hungry, most people would go for a 400-calorie burger while they could have 3 KILOS of celery for the same amount of calories. Okay, who could eat 3 kilos of celery, anyway but you get my point…you need to find alternatives to your go-to-snacks or meals if you want to lose the weight. So today I replaced what used to be my Saturday fry with a healthier alternative. I used two butcher-bought rushers, cleaned them completely of fat, sautéed them in their own juice for 3 minutes then sparingly used my 1-calorie-a-spray Fry Light Extra Virgin Olive Oil and cooked my organic egg alongside. I ate my now healthy Saturday fry with half a slice of rye bread. Delicious and as hubby says, guilt-free!! As a Romanian, I was raised to believe pork meat needs to be in almost every dish and the pork fat was actually tasty(yuck, I know…). 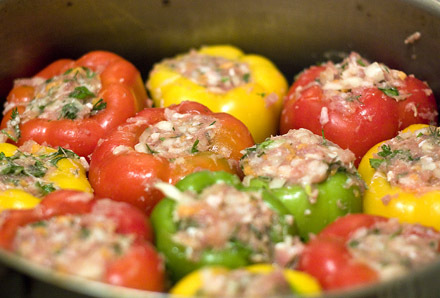 Anyway, one of the staple dishes in Romania is stuffed peppers or stuffed vine leaves. I love them and I love my mum’s recipe but one pepper stuffed with minced pork and beef plus rice and extra oil would easily scor in around 400 calories. So I make my own version now, with lean turkey breast meat, half a cup of rice, leek, parsley, carrot and an organic egg. Verdict? Yummy and low caloric, with less than 200 calories per stuffed pepper, always a winner!! I could go on and on but I will stop here and give you a chance to reflect on the little changes you could make to help your eat a bit healthier :-). Please do share your ideas with me, I would love to hear from you!! This is day 14, there are only 26 days left of this healthy living challenge. Ce faci cand ai o pofta nebuna de ceva dulce??? Eu nu am fost niciodata cu dulcele dar cind am pofta pun cite 30 de grame de cereale santoase(fara zahar sau alte chimicale) cu un pic de lapte intr-un bol si-mi potolesc cheful de dulce.